Could we get by on half our current income? That’s a decision point our family faced when my husband, Tim, retired from a 25-year career as a military officer in 2013. His retirement pension would equal approximately half the income he’d earned on active duty. Although many of his contemporaries were taking on second careers after their military retirements, Tim wanted to spend his “second half” learning, doing, and exploring — instead of working for yet another boss. 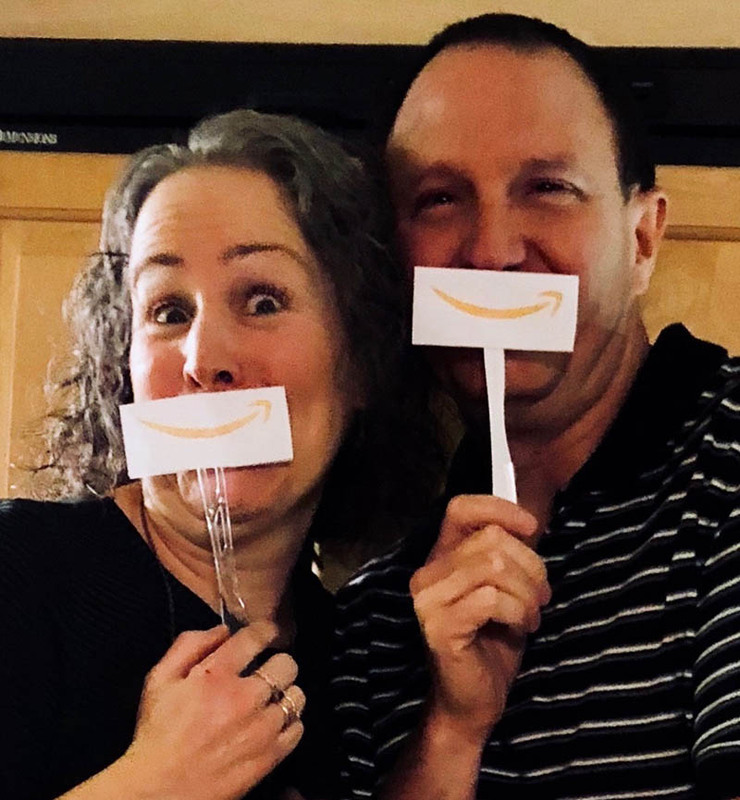 And I knew, after years of frugal spending as the spouse on the home front, that I could help manage our income in order to make that option a reality. In addition, we try our best to minimize spending and debt, and we pay off our credit card statement every month to avoid interest charges. We also take grateful advantage of discounts offered around the country for veterans, we often stay in RV parks on military bases, and Tim does most of our RV maintenance and repair work himself. But Don’t We Get Bored? Not often. 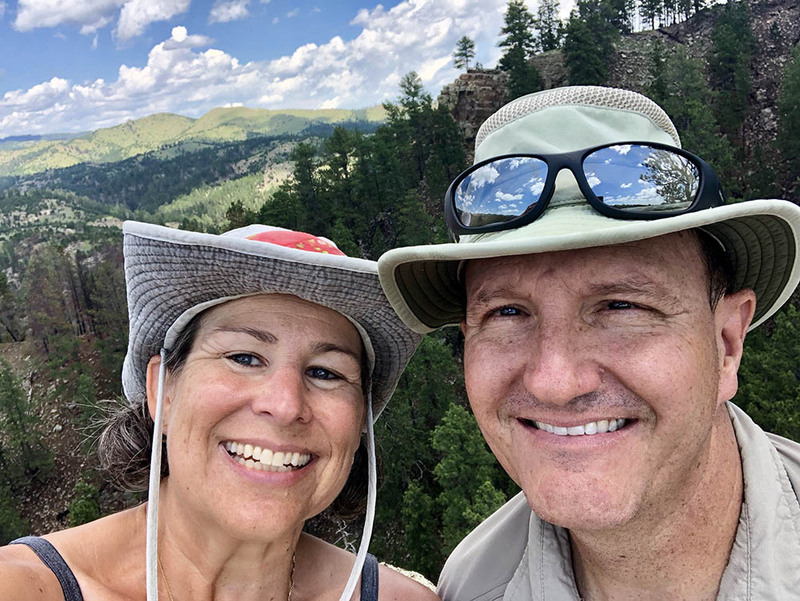 We manage to fill our days just as Tim intended, by learning, doing, and exploring — in addition to tackling the mundane tasks of everyday life, like laundry, cleaning, RV fix-its, and errand running. What we lacked for a time was the rewarding feeling of contributing, and neither of us wanted our time and talents to languish. Since we rarely stay in any given location long enough to volunteer, we started looking into workamping options during our second year of full-timing. We leapt in with all four feet and took on a 3-month “tour of duty” as fulfillment warehouse workers with Amazon’s Camperforce for the 2017 holiday season. 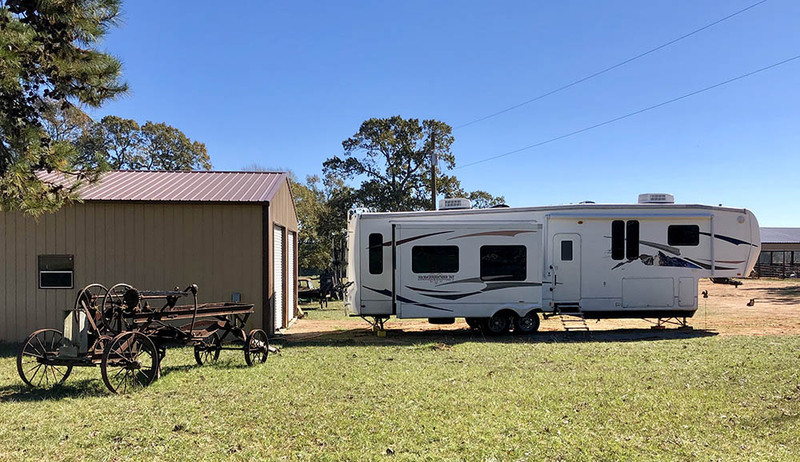 Not only did we earn an hourly wage for our efforts, but our RV site was also paid for as part of the program, so we lived rent-free for the duration. The work was tedious and physically demanding, and we are not likely to do that again, but with the money we earned plus the money we saved, we were able to pay off the loan on the truck we’d bought less than a year before, and to sock a little away for that proverbial rainy day. What Other Workamping Options Have We Tried? Thanks to a friend’s request for help at a city park where he’d been camp hosting, we parked alongside him in central Texas, and spent about 6 weeks assisting with tasks to prepare for the spring and summer seasons. We were not paid a wage, but instead lived rent-free with full hook-ups in return for 20 hours of work per week. 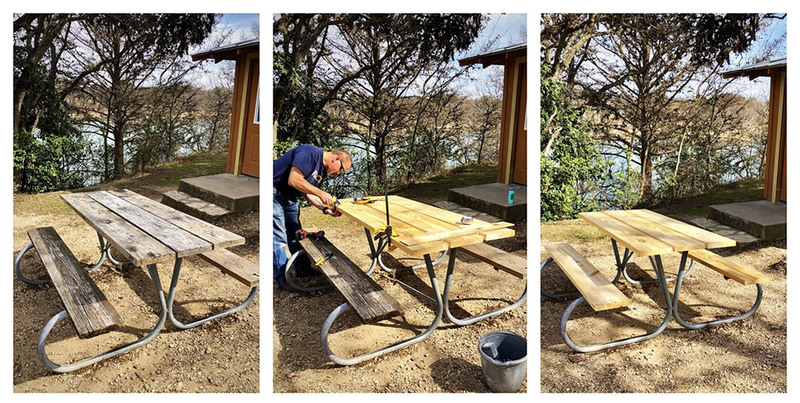 Our duties included picnic table refurbishment, fire ant abatement, campsite clean-up, and yes, occasionally the dreaded public restroom cleaning. Although that last task is high on our “not again” list, we really enjoyed the others, as they provided visible, tangible evidence of work we’d done to make the park better. Tim was able to earn us a nice chunk of change by assisting with something very unique and rewarding. 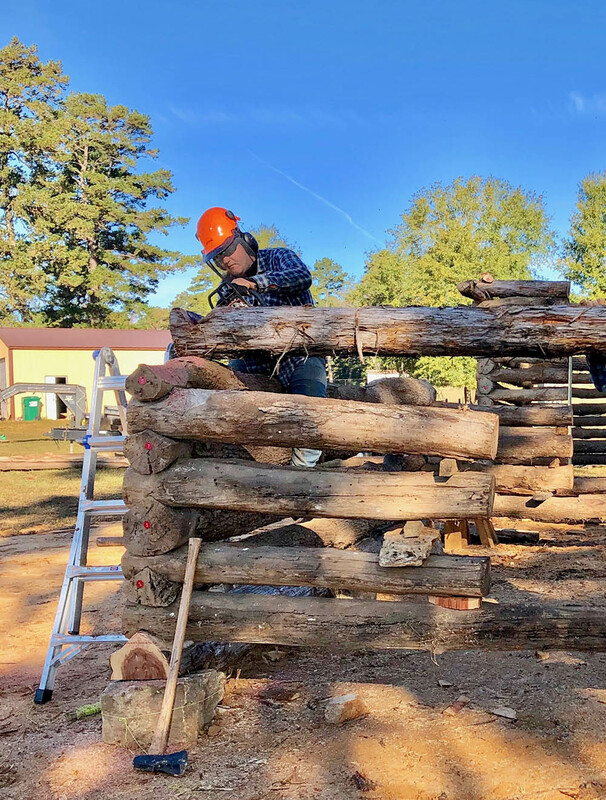 He helped disassemble an 1840’s log barn on a Texas ranch that had just been sold, and later helped reassemble it on the new ranch. He was compensated for his labor, and we were also able to park our RV on the ranch for free. We didn’t have a sewer hook-up, so our stays were limited to about 8 days at a time, but we did have access to fresh water and an electrical hookup. Although not nearly as steady or lucrative, guest blogging has provided us a little bit of spending money, too. For example, the manufacturer of our first RV took me on as part of their blogging team for a temporary stint in 2017, and that paid for a few restaurant meals each month for the 6 months I contributed. Every little bit counts, and of course a big benefit to writing is that I can do it wherever we are, at whatever hour I choose, with some pretty inspirational views out my window! Yes. In only two years, we’ve experienced four wildly different varieties of workamping to supplement Tim’s pension, and although there are some we probably won’t repeat, each one was valuable to us — and we hope, to others — in some way. 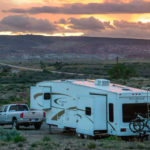 The money we earned and/or saved at each job was definitely a nice boost to our economic well-being, and there’s incalculable value in the freedom of full-time RV living to go where we want to work, when the time is right for us to do so. We plan to continue seeking these opportunities (or letting them find us), and we hope that you’ve now found a little inspiration to look for them as well! 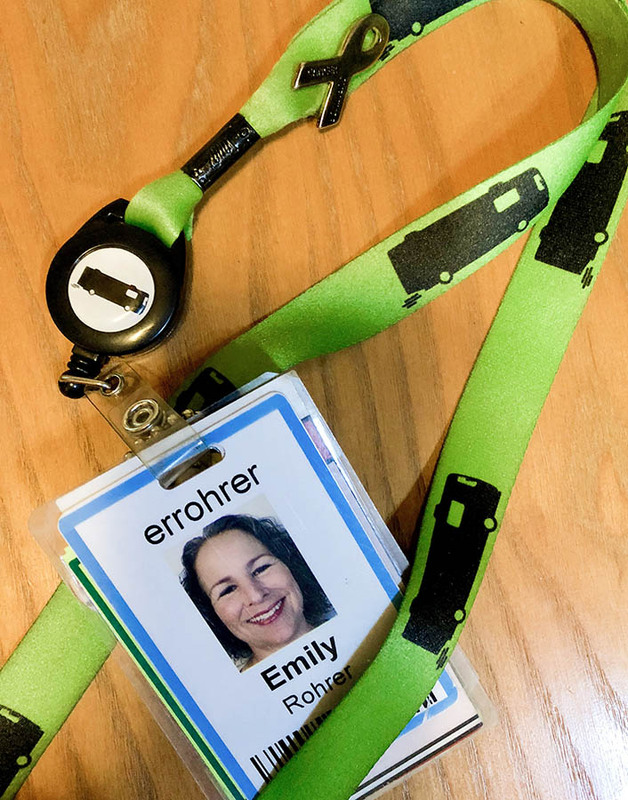 Emily and her husband, Tim, have been living in, traveling in, and intermittently working from a 5th wheel since 2015, and have decided that the lifestyle suits them well enough to stop guessing at how long they’ll keep at it. Who needs the pressure of a timeline? Find them online at www.OwnLessDoMore.us. It is an inspiration to know that you found it was possible to find a new mission after the military, working for what you need and being helpful to others. Thats life. The years pass by and before we know it, they’re gone. You are spending your time well. I am encouraged to to the same. Thank you for contributing your story. Awesome distillation of your experiences! Following the Rohrers is like reading about neo pioneers, with beautiful photos and witty commentary.